As with all Medium Format cameras, given their studio-oriented design, particular attention should be paid to Color Depth and Dynamic Range results. With 26bits and 13Ev, respectively, the Phase One P65+’s results are remarkable when compared to those of previously-analyzed medium-format models. 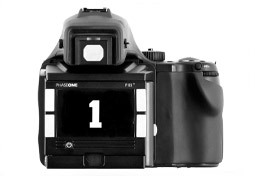 Phase One introduces a new feature—the “Sensor Plus” mode. This particular mode increases the sensor sensitivity and provides an ISO range from ISO 200 to ISO 3200. Besides its Low-Light ISO score (1158) is better than is usual for medium format cameras (the Phase One P45+’s score was only 622). Despite a huge number of pixels (60.5 MPix) and a pixel size very close that of the Nikon D3x sensor (6µm), the Phase One P65+’s results after normalization (“print” mode) stay surprisingly close to those for the Nikon D3x (with 24 Mpix). The Phase One P65+ features the new generation of very high resolution sensors (60.4 Mpix) and a 16-bit A/D converter. This sensor was the first full 645-format sensor on the marketplace, with an ISO latitude that ranges from ISO 50 to ISO 800; the “Sensor Plus” feature extends the sensitivity to ISO 3200 (with a loss of resolution of 15 Mpix). A specific IR absorption filter is used to allow very wide angle lens shots without colored vignetting effects. Please note that such optical benefits of this kind of filter are balanced with a loss of sensor sensitivity. Per above, the Phase One P65’s results are exceptional (1st on the overall DxOMark sensor ranking, 1st for Color Depth, 5th for Dynamic Range). Thanks to its new Sensor Plus mode, the Low-Light ISO score is quite good (1158) in comparison with the previous generation’s (the P45 + achieved a Low-Light ISO score of 622). This Sensor Plus mode utilizes, in fact, a binning method: The analog signals of 4 photosites are combined to obtain single pixel after digital conversion. This well-known technology allows for higher sensitivity, but with a loss of resolution (1/4). Only very high resolution sensors can provide this option. For example, if Nikon featured the same option on the Nikon D3x, the image resolution would be close to 6 Mpix, but its maximal ISO setting would be 25600. Please note that the A/D conversion noise in Sensor Plus mode is lower than A/D conversion noise in standard high resolution mode. Please note that print results are normalized by the proper number of pixels for each ISO setting (60.5 Mpix up to ISO 800, 15 Mpix for higher ISO). The Phase One P65’s ISO latitude in RAW shows a design change when compared to the previous Phase One model:, the latest P45+ provides only two real ISOs, ISO 50 and ISO 100; by contrast, the P65+ provides real ISO from 100 to 800 (in high resolution mode) and from 400 to 3200 (in Sensor Plus mode). ISO 50 (high resolution mode and ISO 200 (Sensor Plus mode) are obtained only by applying a digital gain during RAW conversion.